Mevadhashma Industrial Heaters are specializes in custom made heaters to work with any kind of application. Mevadhashma Heaters manufactures heating units Only using superior quality products, including high grade tubing and magnesium, Etc. Mevadhashma Can offer complete range of Band Heaters , Mica Heaters, Nozzle Heaters, Electric Heaters,Ceramic Heaters and Insulation Jackets, Strip Heaters, Tubular Air Heaters, Tubular Heaters, Cartridge Heaters, Low Density Cartridge Heaters, High Density Cartridge Heaters, and Cast-in Heaters. Our Delivery Terms of Heaters are Just 2 Weeks from the date of confirmed order. Mevadhashma industrials heaters exporting various countries. 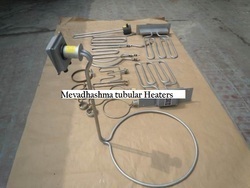 Mevadhashma Can offer complete range of Band Heaters , Mica Heaters, Nozzle Heaters, Electric Heaters,Ceramic Heaters and Insulation Jackets, Strip Heaters, Tubular Air Heaters, Tubular Heaters, Cartridge Heaters, Low Density Cartridge Heaters, High Density Cartridge Heaters, and Cast-in Heaters, esp insulator,etc.